Hello, everyone! Whew, this week went by so fast! Can’t believe its almost Saturday. I have one last project to share with you using Simon’s November Card Kit. You can check out my previous cards here: Handmade for You & You’re the Apple of my Pie. I really like the set of Hand Made for You rub ons that were included in this month kit. I didn’t know what to do with these at first, but as I started playing with them – I couldn’t stop. I used 3 on this project to enhance the design of my patterned paper. 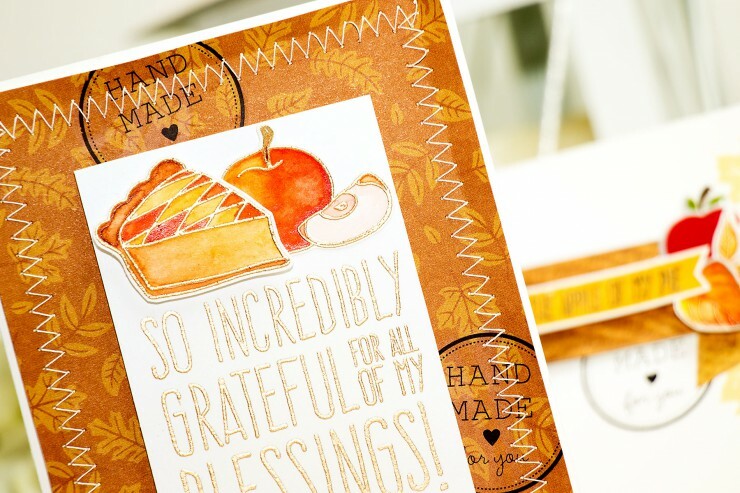 I heat embossed a beautiful So Incredibly Grateful sentiment in brass embossing powder and added a heat embossed pie and an apple on top of my sentiment panel. The latter two were watercolored using Zig watercolor set and fussy cut, the pie element was also foam mounted for a bit of dimension. I also added ziz zag stitching around the perimeter of my patterned paper panel to give it a finished look, love the way it turned out. Like my video? Please click thumbs up and maybe share with a couple of crafty friends? Thanks! Much appreciated! Incredible beautiful and so cozy and yummy!! !